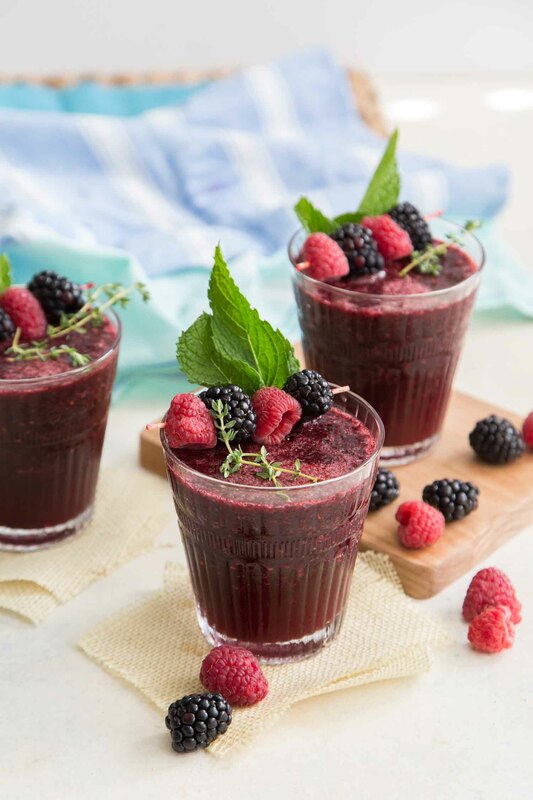 With the help of frozen berries, it is possible to enjoy this blended berry bellini all year long (even in the dead of winter!). Frozen fruits aren’t just for your morning smoothies. They make cocktails a bit more fun and exciting. See: Cherry Jack and Coke Slushie, Watermelon Peach Frosé, and Mango Pineapple Sangria Slush if you really need proof. I was in Las Vegas last weekend for a mini getaway with my best friend. We enjoyed a relaxing day at the spa, afternoon tea, steak, and lots of cocktails. I tried a variety of different mixed drinks that revived my love for experimenting with liquors and flavors. I left Vegas with a ton of new ideas for mocktails and cocktails. 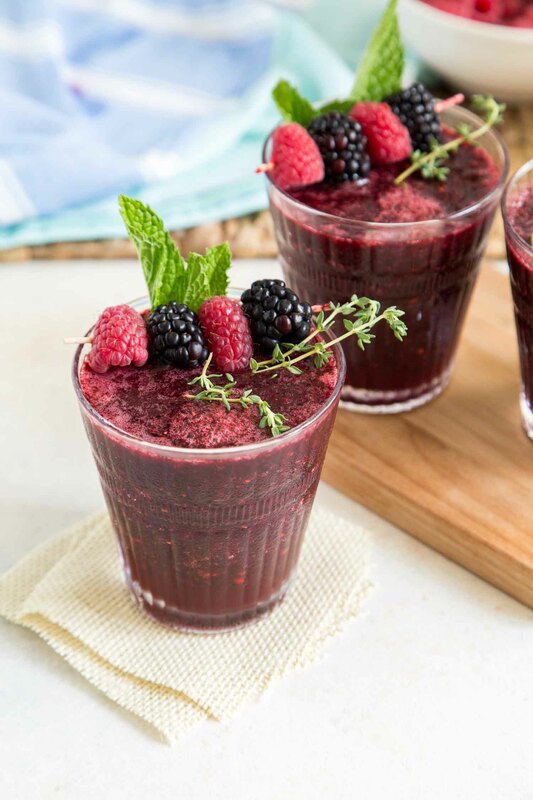 This blended berry bellini combines prosecco with a medley of frozen berries (raspberry, blackberry, and blueberry) and a touch of elderflower liqueur. You can substitute in your favorite frozen fruits. Peaches, strawberries, mango, and pineapple are fantastic with prosecco and elderflower. What are the benefits of using frozen fruits? How do you make a blended berry bellini mocktail version? For a sweet version: use sparkling apple cider or lemon-lime soda in place of the prosecco. Instead of elderflower liqueuer, use a splash of elderflower syrup (or cordial). It’s a non-alcoholic simple syrup flavored with elderflower. Omit any additional sweeteners because the apple cider (or soda) and elderflower syrup will be plenty sweet. For a lighter version: use sparkling water (or flavored sparkling water like Le Croix) with a splash of elderflower syrup (or cordial). 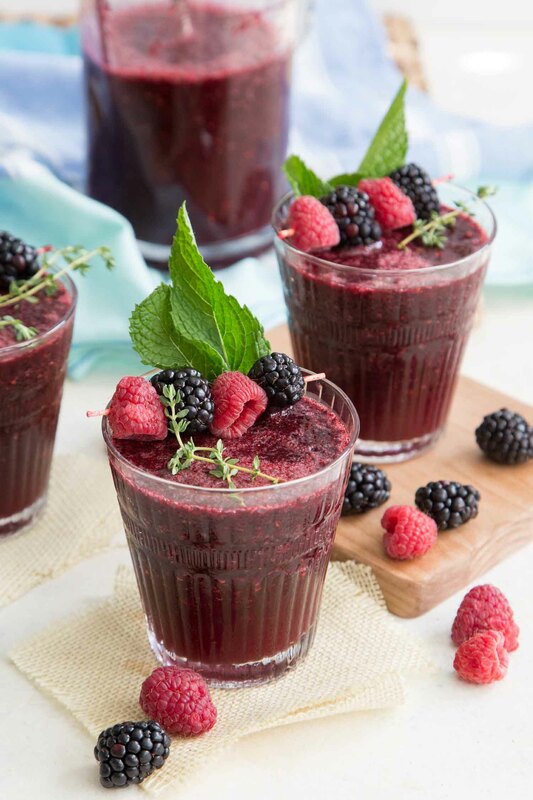 In a blender, process together prosecco, frozen berries, and elderflower liqueur. If desired, sweetened with simple syrup or agave syrup. Garnish with mint or thyme. Serve immediately.